JEAN DUNAND Pièces Uniques present a memorable feat of microengineering complexity in its 2010 super watch: the breathtaking combination of a minute-repeater on cathedral gongs plus an instantaneous perpetual calendar with a unique display of the dates, phases of the moon and leap-year cycle, as well as an ingenious state-of-wind indicator. prevents premature wear and tear. No lag, no moment of indecision. And no margin of error. Leap-year cycles merit their own, equally novel indication: a white plate under the dial, in a cut-out on the dial between 7 and 8 o’clock, illuminates the letter B (for “bissextile”) and the three ordinary years. The leap-year is mirrored by the phases of the moon, with black discs skimming over the surface of the moon as if it were the shadow of the earth, eclipsing it to the left as it wanes, and revealing it from the right as it waxes. The mechanical moon deviates from the real moon by only one day every 120 years. Never has the phase of the moon been indicated on any watch with such elegant artistry. For all the complexity of the calendar indications, the state-of-wind indicator on the back of the watch is deviously simple yet equally original. A single moving part – the mainspring itself in an open barrel – shows the power reserve of the watch against a scale. Shabaka’s minute-repeater strikes on cathedral gongs that go twice around the movement to give a deeper, more resonant chime. 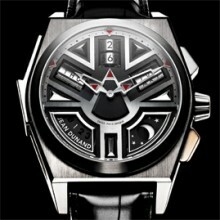 The minute-repeater slide occupies the left of the case, allowing the calendar setting controls to reside on the right. Only two chronographstyle pushers are needed to set the entire calendar, the pusher at 4 o’clock advances the date a day at a time, while that at 2 o’clock advances days only. A push-piece set coaxially in the crown advances the months and years, while the moon is set by a push-piece in the case-band at 5 o’clock. A complex series of levers and rolls insinuate their way around the movement from the pushers to activate the respective calendar indications. The caliber is of a radically original construction, with the perpetualcalendar mechanism integrated into the 13-ligne repeating movement. The 7mm-diameter cylinders are embedded 2.5 millimetres into the level of the minute-repeater to reduce further the thickness of the movement. An anthracite-black finish on the circular-grained baseplate and on the bridges, exquisitely decorated in concentric Geneva stripes, contrasts with burnished steel, ruby and gold to highlight the beauty of the movement. And such beauty is too rare to hide solely for the eyes of the craftsmen who made it. To ensure that the fortunate owner savors every element of the achievement that is Shabaka, the movement and all of its dazzling complexity can be viewed through the case-back. Manually wound minute-repeater with instantaneous perpetual calendar. Days, dates and months on cylinders. State-of-wind, directly by the mainspring. Repeating the hours, quarters and minutes on two gongs. Pushers in the case-band to advance the entire calendar (4 o’clock) and the days only (2 o’clock). Push-piece in the crown to set the months and years. Push-piece in the case-band (5 o’clock) to set the moon. With adjusting screws on an overcoil spring. Calendar plate, 36mm x 3.2mm (14 lignes). Total height with dial and indications, 12.19mm. 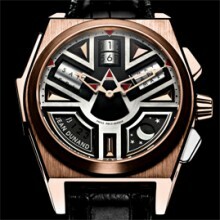 18k white or red gold with a high-tech multilevel dial. Water-resistance, 3 ATM (30 metres). See-through “Skyscraper” style, in 18k gold.